For you protection, these are the rules and precautions that MUST to be complied with to ensure successful flooring installations over AQURON 2000 treated concrete, and be covered by AQURON Corporation's 15 Year Guarantee. Ensure that the surface is absorbent (if it's not absorbent, it must be made absorbent) for adhesive reactions to take place. Ensure that surface is clean and has profile/grip/key for the bonding of adhesives/coatings (If it's absorbent, it will have profile/grip/key). Ensure a full spread of adhesive is applied. 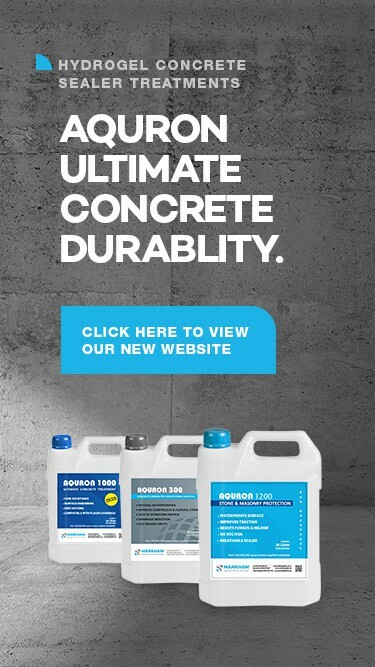 Ensure the concrete is at least 28 days old. Ensure the AQURON 2000 is applied at least 72 hours before flooring is to be installed (Surface must be visually dry prior to any preparation taking place). Check that the concrete has in fact been treated with AQURON 2000 and it is filed in AQURON CORPORATION records. Ensure the same good trade practices which need to be applied to untreated concrete do not change when the concrete has been treated with AQURON 2000. Highly polished or tight concrete surfaces may require grinding to ensure profile/grip/key. During installation and until adhesives have completely cured, cover windows where installed floor coverings are exposed to direct sunlight. Ensure that the adhesive has fully matured before walking on floor covering. Allow adhesives to properly tack-off. Especially for vinyls which have a closed cell backing or a vinyl without profile and grip. Ensure “wet inlay” flooring installations are applied to a completely absorbentsurface or excess moisture is given time to evaporate. AQURON MVB (moisture vapour block). For non-adhered or strip glued flooring installations, the surface of the AQURON 2000 treated concrete must be sealed with AQURON MVB. This product provides the same effect as a full spread of adhesive.